We all know that over 30% of birds are in serious decline. One of the challenges birds face is destruction of habitat. And while the ultimate measure is preservation of large ranges of habitats and biomass, on a micro level, we can all do our part. What you do to help birds in your backyard in winter may have an effect on their success in spring and summer. Migratory birds seek respite in winter from the exhausting business of two migrations and raising a family. They rely on having sufficient food, water, shelter and safety to not only get them through winter but to keep them in a healthy state when they need to leave on an arduous spring migration. Their migratory treks north are often made in haste, as for some birds, arrival on a territorial breeding ground requires being there first to get the prime location. And having a safe and energy-building winter may help them once they leave their overwintering areas. Every time we enhance our backyards to provide more resources for birds either living full or part time with us, or just passing through, we help support a group of wildlife which is very much in need of assistance. Here are a few things you can do to help – pick and choose what you can manage, or make your backyard a home run and do all of them! 1 – Native plants — it cannot be said enough that planting native plants, regardless of how small your yard, garden, or city roof or balcony, will ultimately have more positive impact on birds and other wildlife than anything else you can do long term. 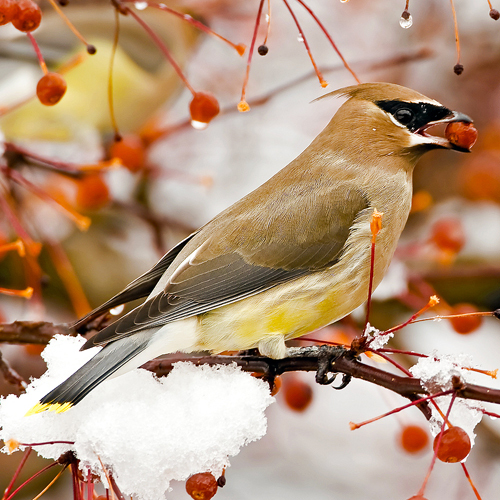 For example, in winter, native plants in your garden will still be providing food for birds. Berries and seeds are now on the plants, shrubs, trees and vines which blossomed beautifully a few months ago. A native plant never stops doing what it’s supposed to do, and can do it better than any of us humans can ourselves. Make native plants a priority, and find out what you should be planting for your area in the native plant database from our friends at Audubon. 2- Make a special winter seed mix of 50% black oil sunflower + 40% white millet + 10% safflower and shelled peanuts. These high energy seeds will provide the power and energy to birds when they need it to survive in the cold and when food becomes scarce. Ground feeders will eat the white millet, so use it in the mix in a way that it can spill out, or put it directly on ground. 3 – Clean fresh water that isn’t frozen is essential. Put out a heated bird bath or waterer that will keep water temperatures over the freezing level so birds can keep from dehydrating in cold weather. Make sure to keep it clean! 4 – Suet is high in fat and calories and birds like woodpeckers, chickadees and nuthatches will be delighted to hang from suet feeders to eat this when the temperature really dips down and there is snow covering the rest of their food. 5 – Don’t throw out those tree limbs! Pile them up to create a safe haven from predators that birds can dive into when they are being threatened. Brush piles also provide a break from the wind or rain for birds. 6 – Roost boxes where several birds can huddle together in a single box are great when the temperatures are really low or there is a wind. These look like nest boxes but they have pegs and screening inside for birds to roost on at night so they can share body heat in an enclosed space. 7 – Support Blue Jays and woodpeckers with peanuts still in their shells on a stump, or pretty much anywhere! Squirrels will love them as well and it may distract jays from taking an interest in attacking your feeders.